Samsung has finally announced the results of the company's investigation into the Note7 accidents today, and it has come to an interesting conclusion. In addition to its own internal investigation, Samsung brought in safety consulting firms UL, Exponent, and TÜV Rheinland to help determine the root causes. Samsung and all other firms came to the same conclusion - the problem was with the batteries (not software or the rest of the hardware), and there were two separate issues that caused the incidents. The original batteries for the Note7 had casings too small to accommodate the electrode assembly, which led to thermal failure and short-circuiting with normal use. Additionally, the tip of the cells' negative electrodes were incorrectly located in the battery structure. You may recall that Samsung started rapid production of a "safe" Note7 after the original model was discontinued, which had new problems. The company moved to another manufacturer for the batteries in replacement Note7 phones, and the new cells were found to have high welding burrs on the positive electrode. This caused the insulation tape to be penetrated, but some cells were found to not have protective tape at all. While each independent firm had their own battery tests, Samsung made a point to show how thorough its investigation was. 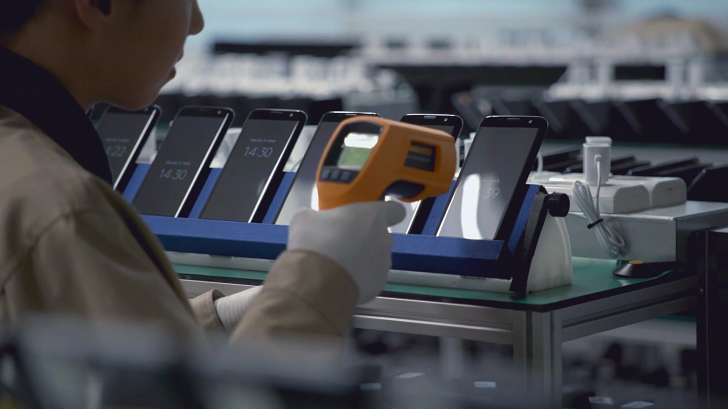 The above image shows the company's charging facility, with countless Note7 and Note7 batteries being repeatedly charged and discharged to replicate the public accidents. Tests performed in the lab included overcharging the device's USB port, using the device with the case off, and even measuring the thermal effects of the Iris scanner. To help facilitate these tests, Samsung created a software algorithm to replicate regular phone usage in the lab. To prevent similar incidents from happening again, Samsung has created a Battery Advisory Group with a handful of industry experts and an eight-point battery safety check. In addition, the company will assign teams to each core component in new products to test and verify safety. Samsung seems confident that the Note7's battery issues have been resolved, and hopefully will not affect future devices - namely the upcoming Galaxy S8. The company said during the conference that 96% of all Note7 phones worldwide have been returned, and hopefully the remaining 4% won't cause any injury to stubborn owners.